So, as another terrific year is winding down, I want to thank some very special people for your continued support of Operation Game On throughout the years as a sponsor, volunteer, participant, or donor. This year was incredible. There were more moments than I have time to write about. Yet there are still quite a few of our men and women Veterans still suffering from the effects of war and because of you, we are here for them. It’s not really about golf, it’s all about getting them back to a somewhat normal life. So then, why does golf work? As you know, golf can be a very frustrating game to learn but it takes their mind off of their injuries and brings out the “can do, will do” attitude instilled in them. There’s other reasons such as the fun factor and a chance to get outdoors and play with friends and build new special memories and bonds. At Operation Game On the special memories stack up quickly, and back in November we had a really special moment. The timing was perfect for their fitting at TaylorMade’s “The Kingdom”. It was on Nov 10, the Marine Corps Birthday and it so happened to also be PGA Tour Professional, John Rahm’s birthday too. As luck would have it, John was at The Kingdom preparing for his upcoming event in Dubai –which he subsequently won. 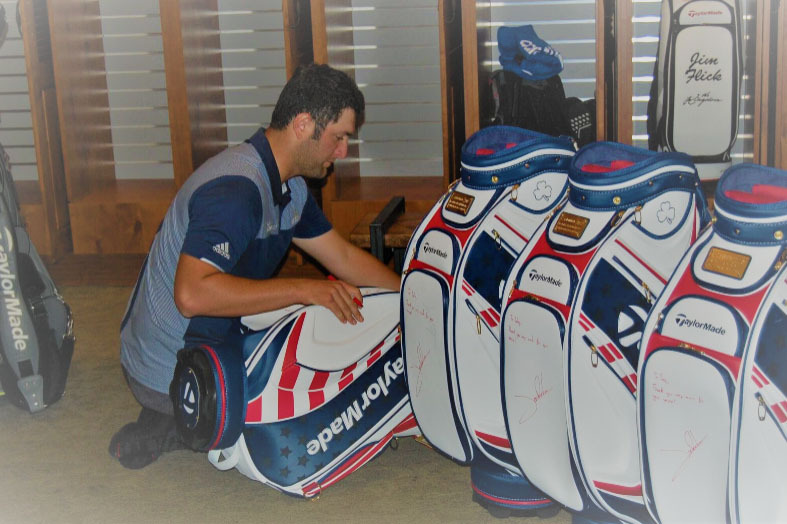 This young PGA Tour star took the time to chat with our troops and signed a U.S. Open staff bag personalized for each one of them and hung around to take some pictures with them. It was an awesome day for our Heroes thanks to the staff at TaylorMade. And unbeknownst to us, before the fitting, about 100 TaylorMade employees gathered at the driving range to greet our troops with an ovation to thank them for their service on this Veterans Day along with the National Anthem which was sung by Joe Horowitz.It was such an emotional day and a highlight of 2017 I will never forget. 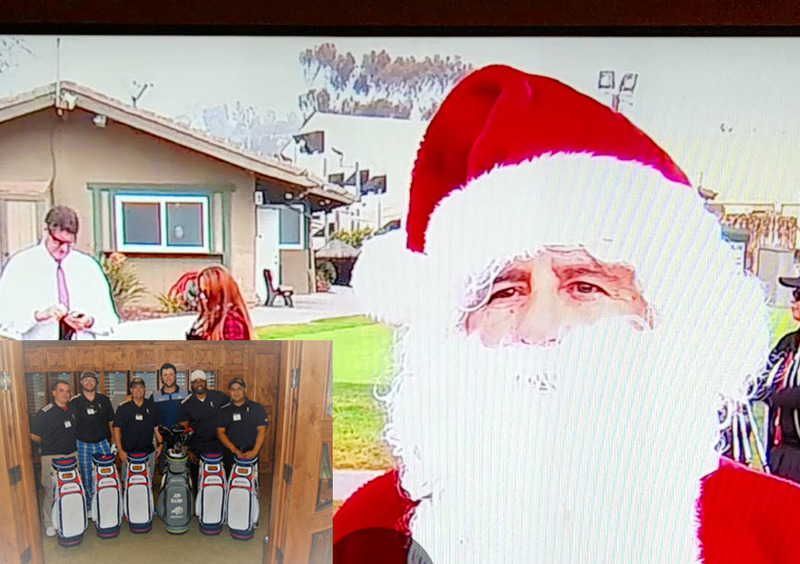 The next morning we were at the Del Mar Golf Center, where we delivered their hard earned golf clubs and made it our own special “Opening Day at Del Mar”. Again, thank you all for your continued support, this is a glimpse of just one special memory among many that we’ve had in 2017 which were made possible with your help. Here’s wishing all of you and your families a very Merry Christmas and a healthy, successful, and Happy New Year! May God bless and protect those still in harm’s way, may God bless all of you, and may God bless America! Stay tuned for information about our 15-inch Cup Challenge Monday, March 5th 2018 (noon-3pm). We have some special things planned this year for this annual hole-in-one driving range party!! !